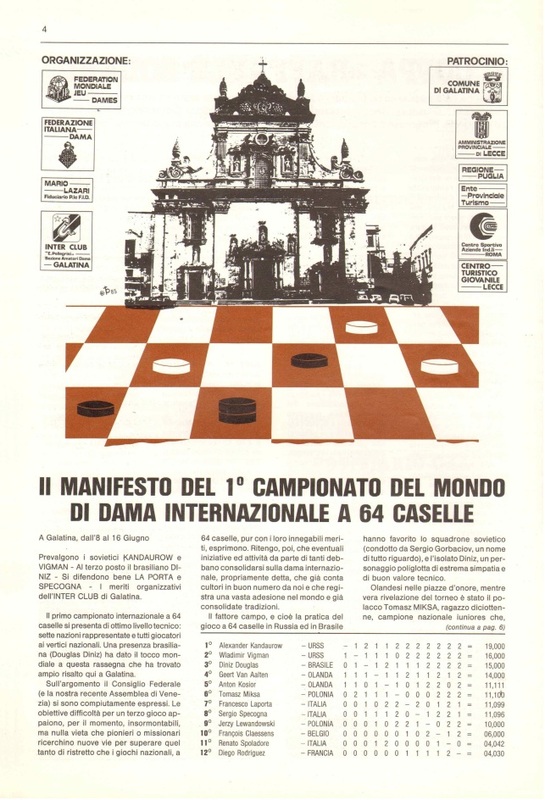 The World Draughts Federation (Federation Mondiale Du Jeu De Dames) FMJD founded in 1947. FMJD is the member of SportAccord and IMSA, strives for Olympic recognition. 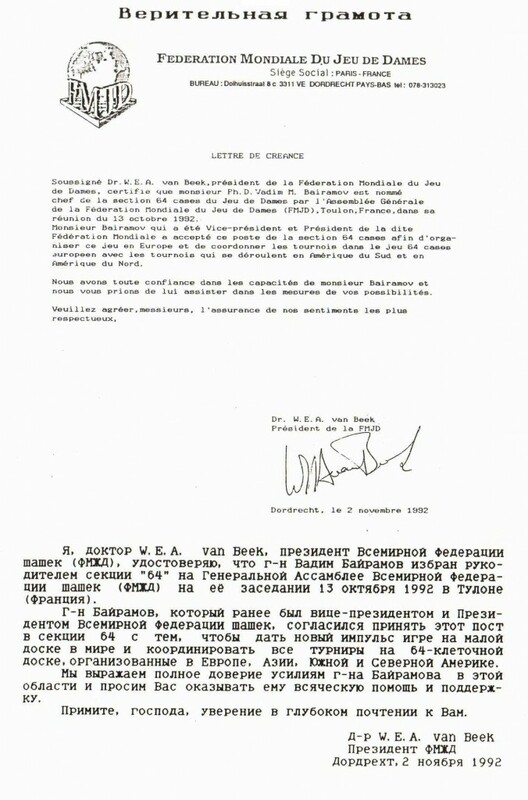 Draughts-64 were accepted into the World Draughts Federation FMJD in 1984 thanks to the huge efforts of the President FMJD Vadim Bayramov. The first world championship for men (Brazilian version) took place in 1985 in Galantine, Italy. The first championship was won by Alexander Kandaurov (USSR). 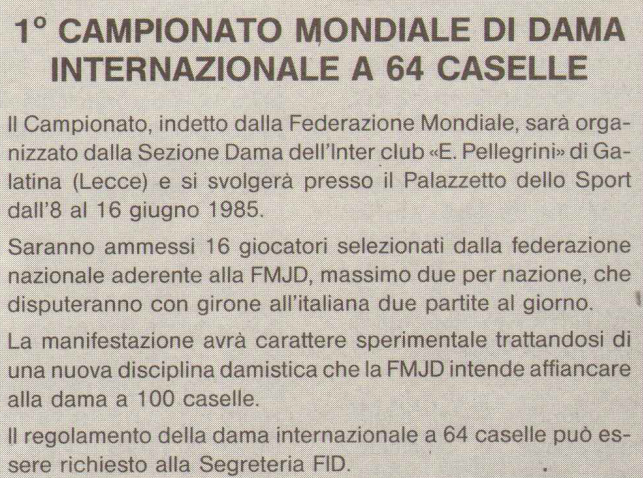 Section-64 FMJD was founded in 1992. The first world championship on the Russian version was conducted in 1993 and was won by Murod Amrillaev (Russia). World Championships for women have been started with 1993, juniors with 1994, cadets with 1993, mini-cadets with 1997, hopes with 2005. Section-64 develops Russian and Brazilian versions of draughts-64. Many people from five continents – Europe, Asia, America, Africa and Australia are playing in draughts-64. Players from 48 countries took part in the events of Section-64 in 2015! In 2012 the Section-64 FMJD celebrated the 20th anniversary of its founding. According to the decision of the Executive Board was issued a special memorable badge, which is awarded to the famous draughts personalities for services to the draughts-64. The first six badges was presented at the European Championship in Pinsk for Anisko A., E. Buzhynsky, S. Gorbachev, V. Moseychuk, Y. Korolev and I. Pashkevich. Another well-deserved personalities will also be awarded during major tournaments of Section-64 FMJD. October 16, 2015 Section-64 left the FMJD and continued its work under the brand of the International Draughts Federation IDF.